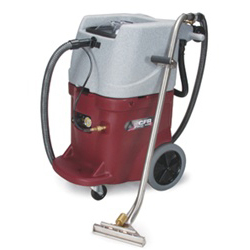 The CFR PRO 500 is an electric carpet extractor. The compact design is ideal for transportation and in buildings with multi-levels. The large rear wheels aid in easy maneuverability. The rotomolded polyethylene body is durable and will last through the toughest of jobs. USA-CLEAN, Inc. warrants to the original purchaser, for the above-stated periods, that machines will be free from defects in workmanship and material, provided that machines are installed, operated, and maintained in accordance with USA-CLEAN’s instructions. The warranty period begins on the installation date at the end-user site. This warranty does not apply to damage or failure caused by accident, misuse, negligence, abuse, improper repair, or maintenance of the machines. Please refer to the Machine’s Operator Manual for proper machine operation and maintenance instructions. USA-CLEAN, Inc. will provide labor and travel for the above-stated periods. Parts replaced or repaired under this warranty are guaranteed for the remainder of the warranty period. Consumable parts, expected to wear from normal use, are not covered under the parts warranty. These consumable parts include, but are not limited to: belts, brushes, pad drivers, filters, squeegees, tires, skirts, battery cables, external hoses, and carbon brushes. Batteries are covered on a pro-rated basis for twelve (12) months on Certified machines. Used batteries and battery chargers sold with machines have no warranty coverage. Certified machines may be returned or exchanged within five (5) days of the delivery date if the machine does not meet end-user quality standards. Return freight is the responsibility of the end-user. After the warranty period expires, repair parts supplied by USA-CLEAN, Inc. are warranted against defects for the period of ninety (90) days, with the exception of batteries which are covered on a prorated basis for twelve (12) months. The repair parts warranty only covers parts, not labor or travel (see service labor section for terms). Labor and travel performed by a USA-CLEAN, Inc. service representative are warranted for thirty (30) days from the date the repairs are completed. This policy does not cover work performed by any service company other than USA-CLEAN, Inc. Service Providers and is restricted to the specific repair operation or component for which a claim is made. USA-CLEAN, INC EXPRESSLY DISCLAIMS ANY AND ALL OTHER WARRANTIES EXPRESS OR IMPLIED, INCLUDING, BUT NOT LIMITED TO, ANY IMPLIED WARRANTY OF MERCHANTABILITY AND FITNESS FOR A PARTICULAR PURPOSE. USA-CLEAN SHALL NOT BE LIABLE FOR INCIDENTAL OR CONSEQUENTIAL DAMAGES, WHETHER DIRECT OR INDIRECT, INCLUDING, BUT NOT LIMITED TO, BUYER'S LOSS OF MATERIAL OR PROFITS, INCREASED EXPENSE OF OPERATION, BODILY INJURY, LOSS OF USE OF PROPERTY OR DOWNTIME. USA-CLEAN, Inc. reserves the right to change its warranty policy without notice.